(The) Boring Investor: How to Get a Multi-Bagger? Trading shares may be exciting, but it's usually the boring stuffs that make money consistently. How to Get a Multi-Bagger? In my last 2 blog posts, I identified the multi-baggers listed on the Singapore Exchange from May 2006 and May 2014 and categorised them according to the industry they are in. This is to understand where multi-baggers come from in the hope of finding the next multi-bagger(s). In this post, I reviewed the list of all multi-baggers that I had since I started investing with my own money 16 years ago. Sad to say, despite the wealth of investing experience, I only have 18 multi-baggers and over the same period, I also have 3 wipe-outs and 8 write-offs. The list of my multi-baggers is shown below. Please note that the bought date refers to the date the stock was first owned. During the holding period, additional shares might be bought as the stock price declined, thus decreasing the average buying price. What can be learnt from this list of multi-baggers? If you notice the bought dates, almost half of the multi-baggers were bought in the years 2001 till mid-2003. Those were the years when we had the September 11 terrorist attacks on US, accounting scandals in US and Severe Acute Respiratory Syndrome (SARS) in Asia. Similarly, another 4 multi-baggers (including A-iTrust due to averaging down) were bought between Oct 2008 and Apr 2009, during the depth of the Global Financial Crisis (GFC). It is as though shares, like wines, have vintage years. Shares bought in certain vintage years perform better than shares bought in other years. Hence, the simplest way of getting multi-baggers is to buy at market depths. That is provided, of course, you still have the capital and emotional strength to buy when practically everybody else is selling. If you sort the multi-baggers according to the dates when they were sold, 4 of the multi-baggers were sold between Jan 2004 and Mar 2004. This is the period of the recovery from the SARS episode. Another 3 multi-baggers were sold between Jan 2007 and Jul 2007, just before the start of the GFC. So, in order to get multi-baggers, not only must you get the buying right, you must also get the selling right! 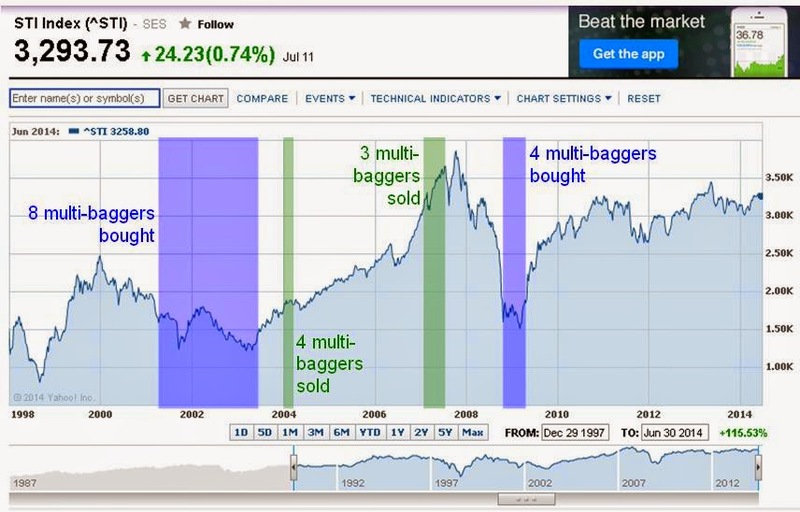 The figure below shows the time periods when the multi-baggers were bought and sold. For the above reason, market-timing remains a cornerstone of the investment strategy for my active portfolio, despite scores of literature showing that market-timing performs worse off than a buy-and-hold strategy. While this theory is true, always leaving some cash in reserve has saved me from total destruction countless times. You may wish to read Have a Plan for my market-timing strategy and Behind Every Successful Bear Market Recovery is A Cash-Like Instrument for my experience in coming back from market depressions. If a company can keep on growing its earnings (at least for a period of time), enough investors will take notice and bid up the share price. Among the list of multi-baggers I had, Fortune REIT and Food Empire both fall into this category. Let's take a look at Food Empire. Between 2000 and 2006, its earning per share grew by 379% from 1.37 cents to 6.56 cents, or at a Compound Annual Growth Rate of 36.8%. 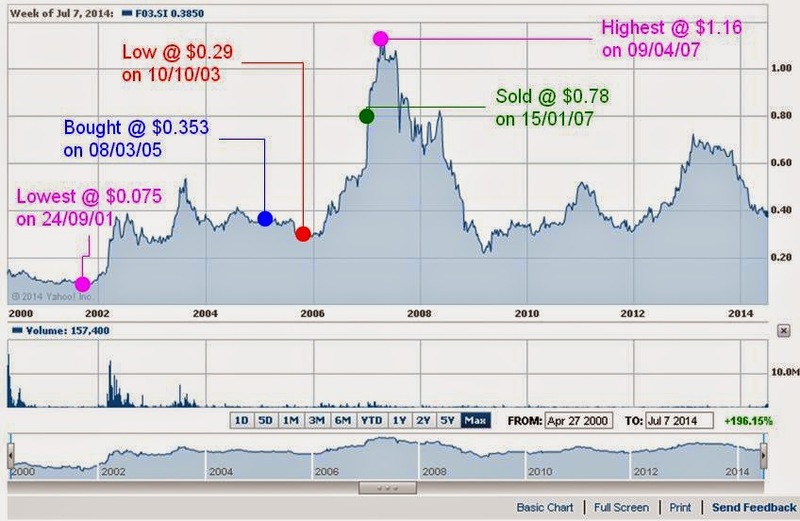 Its share price went from a low of $0.075 in Sep 2001 to a high of $1.16 in Apr 2007, creating a 15-bagger over a 5.5-year period. However, despite "owning" this 15-bagger, I only achieved a 2-bagger from this stock. The figure below shows my entry and exit levels. From the figure above, it shows that I had sold this stock too early. It could have been a 3-bagger had I been more patient and sold near the peak. The moral of the story is that when you have a growth stock on hand, allow it some time to reach its full potential. Nevertheless, it is also important to watch closely when a growth company stops growing. As the figure above shows, growth can sometimes take a breather and the share price can come down in tandem. Fundamental Analysis and/or Technical Analysis can be helpful in determining when to sell. Turnarounds can be a great source of multi-baggers. The biggest multi-bagger I had is actually a turnaround. Magnecomp (now known as Innotek after it sold its harddisk drive business in 2007) had started to lose money when I bought it at $0.29 in Aug 2002, thinking it was a value stock. However, the business went from bad to worse, losing 10.6 cents per share and posting a Return on Equity (ROE) of -17.5% in 2002! 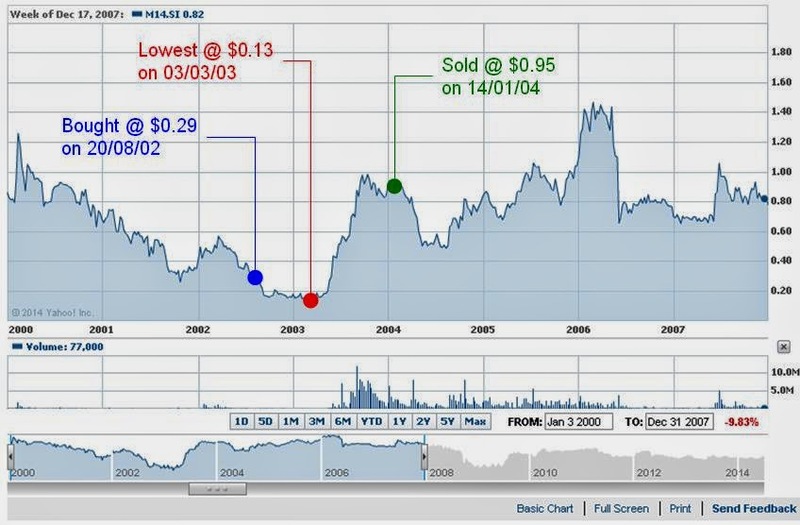 The share price followed suit and hit a low of $0.13 in Mar 2003, resulting in a paper loss of 55% or a negative 2-bagger. In the following year, the company turned around and made 12.2 cents per share. The share price reversed its decline and climbed to nearly $1.00. I sold it at $0.95 for a 3-bagger. The figure below shows the performance of this stock. While turnarounds can be a great source of multi-baggers, they can also be a source of great despair. As explained in the paragraph above, it can turn out to be both a positive or negative multi-bagger. The ideal moment would be to wait till when its troubles are nearly over, but it can be difficult to gauge when is that moment. If you wish to play turnarounds, be emotionally prepared for the roller coaster ride. And as the figure above shows, turnarounds can happen in both directions! Among the list of multi-baggers is a warrant on Multi-chem. Warrants are leveraged instruments and can magnify both the gain and the loss significantly. Thus, it is very easily to achieve both positive and negative multi-baggers from warrants. Nevertheless, the underlying principle remains: the mother share should be rising for whatever reasons (e.g. coming out from market depth, growing, turning around etc.) in order for the warrant to become multi-baggers. If the mother share is not rising, then there is no way for (call) warrants to become multi-baggers. Warrants, like all leveraged instruments, are highly risky instruments. If you wish to play warrants, make sure you can afford to lose the money! For this reason, warrants rarely appear in my portfolio. The above are some of the ways in which multi-baggers can be achieved. In all of these ways, emotional strength is necessary to buy a stock at a low price and/or let a growth company grow to its full potential. Competency in Fundamental Analysis and/or Technical Analysis and mental discipline are also necessary to sell the stock at a high price. If you do not have the emotional strength, financial competency and mental discipline, even a 10-bagger stock might be only a 2-bagger stock in your portfolio. For a 10-bagger stock to develop in your portfolio, you also need to have a 10-bagger emotional strength, financial competency and mental discipline as well. Multi-Baggers -- To Hold or Not to Hold? How many multi-baggers are you still holding now? Just 2 more: Riverstone and Valuetronics. Both barely above the line. Sorry, I don't quite get your question. Yes, sold all multi-baggers except Riverstone and Valuetronics. Nay, far from it. If I were gosu, I won't have to work any more. 18 is really quite impressive, especially considering that you held most for a relatively "short" time. Think many can cite reason 1 for their multibaggers since buying blue chips at the right time would likely qualify. Enjoyed your post very much! Wow! Very impressed with the first one, 110% increase within one month+. You may wish to know that the same stock had a 1-for-15 consolidation in Sep 2012, and I happened to be holding it. The small 2-bagger profit was insufficient to cover the negative 15-bagger loss. Extremely impressed with Fortune Reit, you hung on for that one for 10 years? Wow! Yes, have been holding it since it first listed. Bought and sold a couple of times, but never fully sold it until last year. What if you had not sold any? Wonder what would the same portfolio be worth now? Some of the multi-baggers would probably be back to what they were, as shown by the 2 charts on Food Empire and Magnecomp/Innotek. Will you be doing differently at the next big bear market? e.g. How to Hold a multi-bagger? It really depends on what type of multi-bagger the stock is. If it is due to the bear market or turnaround, I'll probably not hold on to it, in case it declines again. But if it is a growth stock, I might hold on to it. Thanks for your article. Just wondering if you buy into any nasdaq stocks? Any opinions on the next recession/bear market? No, I don't buy Nasdaq stocks. I can't really predict when is the next bear market even if I like to. I try to manage the uncertainty by assessing what should I do at the prevailing market conditions. You may wish to read this blog post for more info. Copyright © Lee Chin Wai, 2012. No part of this website may be reproduced without Lee Chin Wai's express consent. The author shall not be responsible for any loss or lost profits arising from the use of information on this blog. Multi-Baggers – To Hold or Not to Hold? Would I Invest in Astrea IV 4.35% Bonds? Could We Afford a Freehold Property? How Long Can (The) Boring Investor Blog Continue? How Much is Proximity to a MRT Station Worth? Will MVNOs Cannibalise Telcos' Business? Is Starhub's Dividend of 16 Cents Sustainable? Investor, Engineer, Photographer, Blogger, Friend and Son.